All Traeger smoker grills feature the electronic auto-start system, and automatic draining of grease from the cooking area. 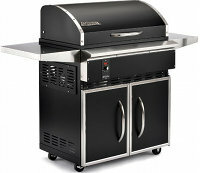 This is the entry level grill which is compact and light, making it easy to transport. Cooking area 292 sq. in. 19.5" x 15"
Slightly bigger than the 'Junior' the Lil Tex has a larger cooking area and a solid state control system. Cooking area 418 sq. in. 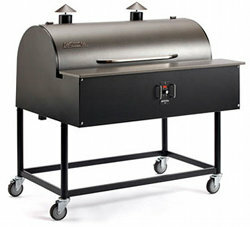 22" x 19"
The Lil Tex Elite Traeger pellet grill has the same body as the 'Elite' above, but also has casters as well as wheels for easier handling. Included is a multi position digital thermostat. Cooking area 646 sq. in. 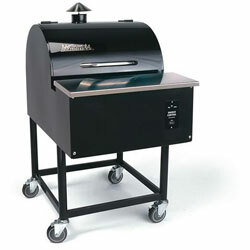 34" x 19"
The Traeger 'Deluxe' is a cabinet style grill mounted on castors and with enclosed storage space underneath. Handy shelf space on both sides. Cooking area 836 sq. in. 44" x 19"
The 'Professional' Traeger pellet grill has a bronze powder coated finish to the grill door, hopper lid and work surface. Digital thermostat and dome thermometer come as standard. Casters are fitted to all legs. A version without legs is available, allowing it to be built into an outdoor kitchen. The design of the Lil Pig always raises a smile. It's bright pink and shaped like a pig! 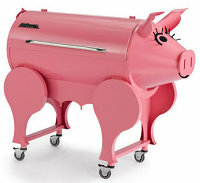 The hopper is concealed within the pig's body. Casters as well as wheels and the digital thermostat control are included.